"I wanted to write about imaginary worlds. Now that our whole planet has been explored other planets are the only place you can put them." — C. S. Lewis, A Reply to Professor Haldane. Stories, nominally Science Fiction, set on an alien world described in lush detail. The world can be Earth in the far distant future, or an alien planet, but it is reached by science-fictional means, not magic. However, the science is largely handwaving. Visitors may arrive on the world by spaceship, and there might be items of Lost Technology present, but overall the world will feel like Low Fantasy — a feudal society with small-scale magic but no Big Bad — and it will share most of the same tropes. Because the "romance" in the title stems from Chivalric Romance, a Love Interest is not in fact required. May involve Weird Science. Schizo Tech may occur. Even if the planet has futuristic transportation, expect, however irrationally, large parts of it to be unexplored, and it to be easy to be out of contact with one's home (and government). Prone to use Medieval European Fantasy tropes, or feature a Feudal Future. Overlaps heavily with the Dying Earth subgenre pioneered by Jack Vance's eponymous novel. Examples set in our solar system tend to involve now-discarded hypotheses about the environments and histories of other planets, such as Venus is Wet and Once-Green Mars. Space Opera is closely related, but the action and adventure tend to take place more in space and on differing planets. Usually it involves at least Interplanetary Voyage. One distinction is that Planetary Romances come from the Jungle Opera tradition whereas Space Operas come from the nautical tradition. Contrast with Single-Biome Planet. See also Pulp Magazine, Swashbuckler, Thud and Blunder, Two-Fisted Tales. The Vision of Escaflowne: Though it initially appears to be fantasy, all examples of "magic" in the series turn out to be highly advanced (read: reality-altering) technology, and no wizards or sorcerers appear, only super-scientists. Paul Pope's version of Adam Strange in Wednesday Comics. (Not the mainstream version, whose Rann has too much high-tech stuff.) John Carter was his main inspiration for the series. The Planet Hulk storyline was essentially a planetary romance. After the Hulk returned to Earth for World War Hulk, his son Skaar received his own title, also a planetary romance... at least until Galactus showed up to eat the planet. This wasn't the first time the Hulk had got a planetary romance; there were also his adventures in the Microverse in the 70s. The Hulk's other son, Hiro-Kala, visits the Microverse in a 2010 miniseries. In the Silver and Bronze ages, Superman, Supergirl and the Legion of Super-Heroes often travelled around the galaxy and visited and explored other planets, mingling with their inhabitants. Warlord of Mars, the comic book adaption of Edgar Rice Burroughs's John Carter of Mars by Dynamite Entertainment. The books were also adapted by Marvel at some point. A lot of the early, world-hopping stories in X-Men and Excalibur are like this, usually written by Chris Claremont and/or Alan Davis, and of course usually centering around Nightcrawler (and sometimes Shadowcat or Wolverine). Starlight: Tantalus fits this trope in flashbacks but in modern day it's more like Earth. Most fantasy creatures were wiped out and the population have turned into Apathetic Citizens who sit in front of their TVs while a dictator rules them. Flash Gordon: The planet Mongo and its various moons are as much characters as the main cast. Avatar is primarily an adventure set on the alien moon Pandora and completely unapologetic about the fact that it's all about a fantasy of Magical Natives in a paradisal world. The two Ewok movies spun off from the Star Wars franchise, which featured sci-fi versions of giants, orcs, and witches. The original Stargate film. The subsequent television shows, however, follow the Wagon Train to the Stars format pioneered by Star Trek: The Original Series, exploring strange new worlds and seek out new life forms and new civilizations. Thor: Ragnarok is a deliberate throwback to the genre. Much of the action takes place on Sakaar, a chaotic Landfill Beyond the Stars ruled by a mad Evil Overlord, populated by countless alien species and located at a nexus of wormholes, all constantly dumping the lost junk of the universe onto its surface. Director Taika Waititi cited the cult '80s movie Flash Gordon (1980) as a major influence on Ragnarok. Dragonriders of Pern, the entire series by Anne McCaffrey, features dragons on an alien world. At the beginning of the series a prologue introduces the sci-fi aspects, but it is not until much later in the story that they become more apparent. Dune by Frank Herbert. The book, while perfectly serviceable as a straight example, is actually a Deconstructor Fleet of the genre's conventions. David Lynch's Film of the Book plays the tropes much straighter. 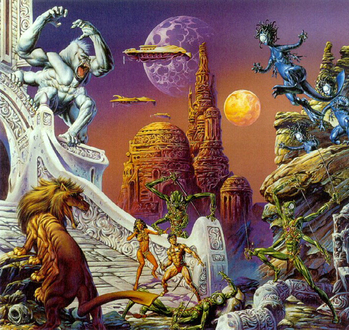 Edgar Rice Burroughs's John Carter of Mars. Between these and his Carson of Venus books, pretty much the Trope Codifier. Ursula K. Le Guin's SF novels tend to steer this way: The Left Hand of Darkness, Rocannon's World, etc. At least in the sense of having the planets be a pseudo-feudal setting — she generally avoids the more magical elements. The Last Guardian (2001) while being a religious story, utterly glories in the alien world of Noron, the people and culture, the dinosaurs. The Lords of Creation series by S. M. Stirling is set in a present day Alternate History where Mars and Venus, thanks to the intervention of Ancient Astronauts, are similar to the worlds portrayed in Edgar Rice Burroughs novels. Leigh Brackett's Mars, Venus, and Skaith series, which are essentially Low Fantasy Darker and Edgier versions of Burrough's series. The Novels of the Jaran start this way, but become more sci-fi as the series progresses. Old Mars and Old Venus are two (forthcoming) anthologies edited by George R. R. Martin and Gardner Dozois homaging old planetary romance stories set on Mars and Venus. Mary Gentle's Orthe series. Slightly different in that Orthe is an alien world, populated by a race who apparently destroyed the high-tech and highly advanced race who once ruled it, and deliberately regressed to a much less technologically advanced state. In Mark Hodder's A Red Sun Also Rises, a doubting priest and his hunchbacked sexton are taken by a tribe of cannibals and transported to an alien world which starts their adventure. Most of The Space Trilogy by C. S. Lewis, including Out of the Silent Planet (set on Mars) and Perelandra (set on Venus) but not That Hideous Strength, which takes place on Earth. Ray Cummings' Tama of the Light Country is a surprisingly feminist work for 1930. It also zilches the one-culture-per-planet rule. Tama is a very young woman who leads a revolt of "winged virgins" against a long-established law that women must have their wings amputated (sans anesthesia) upon marriage. Terminal World by Alastair Reynolds, is set in the far future on a planet hinted to be a terraformed Mars. L. Sprague de Camp's Viagens Interplanetarias series is an attempt to do a semi-Hard SF version of Burroughs. Terry Dowling's Wormwood, a compilation of short stories taking place on a future Earth, which explore the place of humans in a world long since conquered by — and modified to suit the needs (whims?) of — a technologically-superior alien race, as well as several client species. From the same writer: The Adventures of Tom Rynosseros, featuring a sandship captain in a far future Australia, now reclaimed by the Aboriginal nations. Radiance is a combined homage to this subgenre and to the roughly-coincident Golden Age of Hollywood, set in a solar system in which all worlds are inherently hospitable to Earth-like life and colonised by humans. "The Daleks" - the crew land on the post-apocalyptic jungle planet Skaro, and go to explore the gleaming city in the distance to find a vital component for the TARDIS. They accidentally spark war between the Noble Savage Thal race, and the Little Green Man in a Can Dalek race, and lead the Thals into the Dalek city to attack them for good and get the TARDIS back. "The Web Planet" - probably the most clear example of this. The TARDIS is ensnared in a web and when Ian and the Doctor leave to investigate, Barbara becomes possessed and the TARDIS console is stolen, seemingly by giant ant creatures the Zarbi under the instructions of their Queen. The Menoptera save Barbara and befriend the rest of the crew, and they set off on a journey exploring their planet, encountering various different kinds of insect people, and battling the Animus (a sinister Plant Alien that has taken control of the Zarbi). Has lots of very dreamlike imagery such as the Menoptera flying in space through an Alien Sky, the surreal sounds made by the Zarbi and their larva that they use as weapons. Blue Planet from Fantasy Flight Games is set on the water world of Poseidon and exploring it and surviving its inherent dangers are major parts of most campaigns. As a twist to its obvious "new colony" setting it's actually inhabited by Sufficiently Advanced Aliens. GURPS Planet Krishna adapts L. Sprague de Camp's Viagens Interplanetarias series, and GURPS Planet of Adventure is based on Jack Vance's Planet of Adventure series. "The Iron Lords of Jupiter" was a scenario published in Polyhedron magazine for d20 Modern; its rules could also be adapted to Dungeons & Dragons. The setting posited that beneath Jupiter's cloud cover, the planet is solid just like Earth and home to hundreds of alien cultures with Iron Age-level technology, and the player characters are either natives or stranded humans. The reason for Jupiter having the same force of gravity as Earth was left as an exercise for the game-master. Pathfinder's Golarion is set up to facilitate this. The elves are actually of alien descent, and their ancient portals to other planets still exist. Some creatures such as nightgaunts can fly through space. Spells which allow this kind of travel are listed. The entire Distant Worlds source book exists to flesh out the rest of the solar system as well, which generally consists of a mix of earlier ideas of the solar system mixed with eldritch horror. Aballon(Mercury) is a sun-baked world inhabited by robots with scattered habitable ice caverns, Castrovel(Venus) is a jungle with dinosaur riding amazons and is the homeworld of the elves, Akiton(Mars) is a dying world covered in ancient ruins and is home to Expies of Green and Red Martians and a colony of Elder Things, and so on. The outer planets are even stranger, such as Tidally Locked Planet Verces, Triaxus and its generations-long seasons, and Nightmare Fuel incarnate Aucturn. The RPG Starfinder promotes the setting to a full Sci-Fi one, taking place centuries later. A major inspiration for Rocket Age, especially Mars. Skyrealms Of Jorune had almost unplayable game mechanics, but an overwhelmingly complex and facinating alien world setting that also incorporated After the End. Space 1889 is Victorian colonial adventures on carefully described planets with a heavy dose of Steam Punk. Unlike most planetary romances, the science (particularly the one which is based on different natural laws and thus doesn't really work in our world) is carefully described. Masters of the Universe, mostly in the early minicomics where Eternia was an Scavenger World. BIONICLE is ambiguous at first when there is only a single island, then becomes a clear example as an underground alien civilization is uncovered (actually the body of a downed Humongous Mecha). A new planet that's later introduced is an archetypal example of this trope. Albion kicks off with the heroes crash landing on a planet. They first arrive in an alien world inhabited by cat people who use magic and Organic Technology, but later regions accessed in the game could easily look like medieval europe, complete with celts as inhabitants who worship ancient celtic deities. Dark Scavenger describes the species and cultures of the world in detail. The Iron Grip series arguably counts, but is sort of a subversion, since it averts Medieval Stasis (in favour of timeless Schizo Tech) and combines Planetary Romance with the War Drama genre. The first two Metroid Prime games have protagonist Samus exploring a single world each. She is tasked with saving each world from sheer destruction and can find in-depth information about the planets' rich history and wildlife through scanning lore, research and creatures. The third game becomes more of a space opera with the ability to explore and travel between multiple planets. While the individual games are mostly just High Fantasy, the Final Fantasy franchise as a whole indicates that it is this via its Canon Welding. It has been established that all of the worlds of Final Fantasy are part of a shared multiverse separated by a nothingness called the Void, something that occasionally spawns (or defeats) villains and can be crossed by characters with sufficient magical or technological means. Space travel between the worlds is theoretically possible and has happened once or twice, or has been part of villains' plots (e.g. Sephiroth's plan to use the Planet as a spaceship to find another planet in Advent Children). Final Fantasy V in particular involves travel between different planets via meteorites. Horizon Zero Dawn is an example of this trope set on post-apocalyptic Earth, where a Feudal Future society of viking-like clans battle enormous robot dinosaurs and each other. The Oddworld series takes place on the titular Oddworld, and is a Dystopa story about the endless destruction caused by industrialized species and the effects that out-of-control business excesses with no morals have on the more vulnerable races. There's plenty of Slave Races and Last of His Kind to go around with a heavy Green Aesop. Fantastic Planet (La Planète sauvage), the bizarre, surreal French animated film.